On Saturday 31st January, Cardiff Rivers Group completed their 100th event since their formation in 2009. Event photographs can be seen on our Flickr page. 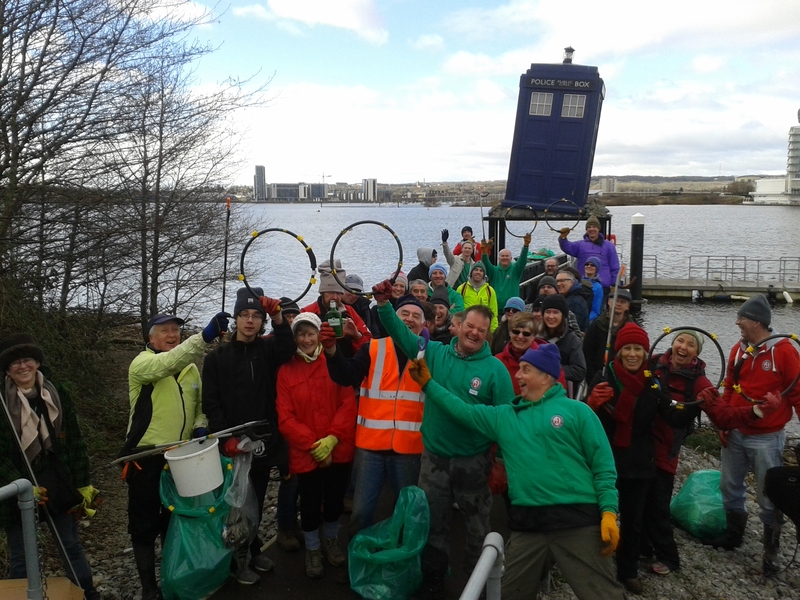 There was a huge turnout for this milestone event with 37 volunteers turning up in freezing, blustery conditions to clean up the Dr Who beach in Cardiff Bay. They were assisted by 2 staff members from Cardiff Council’s Parks services. The event was a great success, and together the team patrolled the bayside completely filling 2 floating skips (supplied by Cardiff Harbour Authority) with rubbish. Group member, Sarah, baked a wonderful, themed 100th event cake which volunteers enjoyed after the clean-up as they retired to Cardiff World of boats for a warm-up and well deserved drink. Cardiff Rivers Group always welcome new volunteers, so if you would like to get involved just get in touch. The next event will be held on Friday 20th Feb as the group will be holding a ‘Tidy Tea Break’ to raise funds for Keep Wales Tidy who were instrumental in helping set CRG up in 2009. The next practical event will take place on Sat 21st Feb in Forest Farm.